The Yallourn mine is owned by EnergyAustralia (formerly known as TRUenergy), a subsidiary of the CLP Group. The Yallourn West mine produces approximately 18 million tonnes of coal a year which is supplied to TRUenergy's Yallourn W power station. On its website, the CLP Group states that the mine is "the second largest open-cut mine in Australia" which is "managed by a Roche Thiess Linfox (RTL) joint venture under an alliance contract with TRUenergy." "The monitoring data shows the whole NE Batter was subject to large scale deep seated movements for a number of years prior to the collapse. The area of movement was of the order of four times or more larger than the eventual failure. The movements followed a long-term accelerating pattern and extensive experience shows that unless these movements ceased or were stabilised, failure was always likely to occur. There was also upward creep of the mine floor. These movements, in about the last year and a half prior to the failure, caused disturbances to the existing groundwater regime around the NE Batter. These disturbances occurred within the batter itself in the coal and also extended to considerable depth below the coal in the interseam clays. These movements and disturbances were occurring well before the coal mining reached the final NE Batter. 1. Maintaining a low groundwater level in the coal seams, using horizontal bores. 2. Ensuring low groundwater pressures in the aquifers and interseam clays below the mine floor and the batters. Traditionally this was carried out by deep aquifer dewatering. Commencing around 2002, the documents indicate there was an effort to try and improve the overall efficiency of the mine, with questions raised over the need for routine horizontal bores, the requirement for continued deep aquifer dewatering and whether the monitoring and external engineering support could be reduced. Over time, studies and engineering modelling were carried out and some trials undertaken to assess some of these questions. In about 2002 or 2003 following external evaluation and advice a decision was taken to stop routine drilling of horizontal bores. Although this evaluation was for the older part of the YEF, with different geotechnical conditions, somehow this decision also became applied to the NE Batter. Given the geotechnical conditions in the NE Batter, horizontal bores were always required and were critical for stability. The absence of horizontal bores was a major factor in the failure. In 2004 following external assessment and advice from a number of different consultants, the deep aquifer dewatering bores in the mine floor were switched off and the bores were allowed to free flow under artesian conditions. The decision was also influenced by changes in the hydrogeological model in this part of the Yallourn Mine. The implications of these changes were not fully appreciated. The models used for assessing the impacts of cessation of deep aquifer dewatering were a simple weight balance model. The analyses centred around this model were focussed on rises in interseam pore pressures associated with rises in aquifer groundwater pressures. When significant rises did not occur the conclusion was drawn that there is no problem. However the impact of high, relative to the mine floor, and unchanging interseam pore pressures does not appear to have been appreciated." Unions representing workers at the mine believe that the only reason no one was injured or killed was because the collapse occurred around 2a.m. in the morning. Chris Fraser, the executive director of the Victorian Minerals Council complained that the government's response would impose additional costly burdens on the mining industry. "The recommendation for another layer of industry-wide regulation, funded by a new industry levy, should not be adopted by the Victorian Government. It is unnecessary and a disproportionate response," he stated in a media release. "It's a consultant's bonanza," he told The Age. In another interview, Fraser complained that "the Government is preparing to establish a technical reference panel to review the geotechnical plans and activities of all mines. Mines will be forced to produce a technical report to the reference panel, which will undoubtedly add thousands of dollars in consultancy fees to each mine." With Yallourn's East Field anticipated to be exhausted in 2007, Yallourn Energy -- the name was later changed to TruEnergy -- sought permission to divert the nearby Morwell River in order to access the coal deposits in the Maryvale coal field. The Morwell River Diversion was projected to allow the Yallourn mine to operate until 2032. The 3.5km diversion was constructed over five years with an investment of A$122 million, and came in on time and on budget. The river diversion project was undertaken by SMEC "in conjunction with RTL and Golder Associates". "SMEC's services included: extensive investigations and hydrologic modelling to verify the feasibility of diverting the river, design of the embankment including its zoning, design of tunnels and associated services for the conveyors which passed beneath the river embankment, design for relocation of services, erosion protection works and environmental and ecological studies," SMEC's website states. The following day TruEnergy reported that "in the early hours of this morning, the TRUenergy Yallourn coal mine experienced significant water leakage into one of the coal conveyor tunnels under the Morwell River diversion. This follows a period of heavy rain. The water is leaking into the open cut and has stopped operations on three conveyors that transport coal to the Yallourn Power Station." While TruEnergy initially described the problem with the river as "leakage" the following day TruEnergy described the problem as being the "collapse of a section of the Morwell River Diversion which allowed water into the mine." As a result of the water flooding in, all four conveyor belts were out of action and the company desperately sought to organise a fleet of trucks to carry coal to the power station. At the time of the flood one of the power stations four generating units was undergoing maintenance and, the company stated two were on 'standby' and one operating. On the Wednesday TruEnergy stated that the one operating unit was operating "at a reduced capacity". The following week, TruEnergy's group executive of operations and construction, Michael Hutchinson, told the ABC Gippsland that the power station would be operating back at 75% of capacity the following week. "We're certainly not looking at it as a going out of business event," he said. Two weeks after the collapse, EnergyAustralia was still struggling to bring the crisis under control. The company stated that while it had reinstated one of the conveyor systems, further rain had resulted in the need to shut it down once more. As a result it had scaled power generation back from two units to one and resorted to trucking coal to keep the power station running. Plans to install a pumping and pipeline system to divert the Morwell River flows into the diversion channel "will not be completed until end of July", the company stated. The company also gained approval from the Environmental Protection Authority Victoria to pump untreated water out of the pit into the Latrobe River. By late July, the recovery plan was still far from completed. While the company reported that a third generator had been brought online in mid July, only a "partial diversion" of the Morwell River had been achieved and that a "full temporary diversion" would not be completed until August. "A second conveyor will be reinstated once the full temporary river diversion is in place and water levels are reduced further," the company stated. Another month later the company reported that it had succeeded in preventing the Morwell River further flooding the mine and that it would focus on "reducing water levels in the East Field section of the Mine so we can recover and reinstate a second coal conveyor to ensure we have a reliable supply of sufficient coal." By mid-September 2012 the company stated that further heavy rainfall had resulted in even more water flooding into the mine pits. Further, the company warned that a permanent repair of the Morwell River Diversion "is expected to take eight months to complete depending on weather." The collapse of the diversion embankment had significant impacts. In late 2012 EnergyAustralia's parent company, CLP, reported to the Hong Kong Stock Exchange that it had suffered a $HK644 million (approx A$83 million) loss due to the "costs of the incident, including a provision for river diversions, levees and dewatering and an impairment of fixed assets". It also earmarked an additional cost of $26 million for the rest of the financial year. Part of the impairment costs were from the idling of three of the power stations three units for most of June. The company also stated that it had delayed plans for the share market float of EnergyAustralia at least until 2013. The fourth unit was out of commission until early August 2012. The leader of the Victorian Greens, Greg Barber, called for a parliamentary inquiry into the disaster while Environment Victoria called for an independent inquiry. "We understand about 700 ML [megalitres] of water has been accumulating on the mine site each day since the company dammed the Morwell River following the collapse of their ill-conceived river diversion. This low quality water is now being pumped into the Latrobe River with unknown impacts on the river and the Gippsland Lakes downstream. Its not good enough for coal miners to turn our rivers on and off so they can keep accessing coal, and then use the rivers as a dump for polluted water," said Environment Victoria's Campaigns Director, Make Wakeham. The Opposition Labor Party backed calls for a parliamentary inquiry. For its part, the Victorian government initially avoided making any commitment to an inquiry. However, over a month after the disaster the Department of Primary Industries announced that it had "commenced a formal investigation under the Mineral Resources Sustainable Development Act (MRSDA) to determine both the root causes of the failure and whether there has been any breach of statutory requirements on the part of the mine operator." ↑ Professor Tim Sullivan, "Yallourn Mine Batter Failure Inquiry", Parliament of Victoria, June 30, 2008, pages ii-iii. ↑ 4.0 4.1 Melissa Fyfe, "Experts missed obvious signs before mine collapse", The Age, January 4, 2009. ↑ "Release of Mining Warden Report: Yallourn Mine Batter failure", Media Release, Minerals Council of Australia, December 4, 2008. ↑ Jessica Darnbrough, "Victorian mines get slapped with red-tape", Mining Australia, December 8, 2008. ↑ TruEnergy, "Coal Mine", TruEnergy website, accessed June 2012. ↑ SMEC, "Morwell River Diversion", SMEC website, accessed June 2012. ↑ "Rain shuts down coal supply", Latrobe Valley Express, June 5, 2012. ↑ TruEnergy, "Water leakage reduces coal supplies at Yallourn mine", Media release, June 6, 2012. ↑ TruEnergy, "Update on Yallourn mine", Media Release, June 7, 2012. ↑ "Future of Yallourn open cut mine is safe, says TRUenergy", ABC Gippsland, June 15, 2012. ↑ EnergyAustralia, "Yallourn Mine Update", Media Release, June 22, 2012. ↑ EnergyAustralia, "Yallourn mine recovery works on track", Media Release, July 26, 2012. ↑ EnergyAustralia, "Another Milestone in Yallourn Mine Recovery Operation", Media Release, August 28, 2012. ↑ EnergyAustralia, "Yallourn Mine Recovery Update", Media Release, September 14, 2012. ↑ 17.0 17.1 Melody Song, "$109m bill for Yallourn", Latrobe Valley Express, August 21, 2012. ↑ Brian Robbins, "TruEnergy's ASX listing delayed as flooding hits results", Sydney Morning Herald, August 14, 2012. ↑ EnergyAustralia, "Energy Australia: Business Update", October 24, 2012, page 11. ↑ Ashley Gardiner, "Greens call for inquiry into Yallourn coal mine collapse", Herald Sun, June 19, 2012. ↑ "Mining stops at Yallourn as flooding continues:Urgent Inquiry needed into Mine failures", Media Release, June 22, 2012. ↑ Adam Morton, "Fresh calls for Yallourn inquiry", The Age, June 25, 2012. ↑ Department if Primary Industries, "Yallourn Coal Mine Inquiries: Collapse of the Morwell River Diversion at the Yallourn Mine June 2012", Department of Primary Industries website, July 27, 2012. Wayne Taylor, "Coal mine collapse", The Age, November 2007. Peter Batchelor, Minister for Energy and Resources, "Government Announces Yallourn mine inquiries", Media Release, December 7, 2007. TRUenergy, "Subsidence reduces production at Yallourn mine", Media Release, November 14, 2007. TRUenergy, "Works commence to restore Yallourn coal mine", Media Release, November 15, 2007. TRUenergy, "Update on River Diversion and Generation Restoration at Yallourn", Media Release, November 22, 2007. TRUenergy, "Yallourn mine operations fully restored", Media Release, March 18, 2008. Shaun Malla, "Mi9ne Collapse", Latrobe Valley Express, November 15, 2007. Heath Aston, "Workers spared in Victorian mine collapse after flood", Daily Telegraph, November 15, 2007. "Yallourn mine inquiries commence: Two government inquiries have begun into last November's Yallourn mine collapse", Safety Solutions, January 15, 2008. Australian Energy Market Operator, "Victorian Electricity Supply Update", Media Release, June 6, 2012. Louis Nelson, "Water leak worsens", Latrobe Valley Express, June 6, 2012. Pia Akerman and John Ferguson, "Flooded Yallourn coalmine seeks alternative fuel", The Australian, June 06, 2012. Megan Levy, "Floodwaters pour into coal mine but power supplies safe: minister", The Guardian' (Swan Hill and Riverina), June 6, 2012. Erin Michael and Ashley Gardiner, "High tide combines with flood threatening 400 homes as Yallourn Power Station at reduced supply", Herald Sun, June 06, 2012. "Victorian Electricity Supply Update", Media Release, June 7, 2012. "TRUenergy Yallourn Power Output Remains Constrained by Flood Damage", Fox News, June 06, 2012. 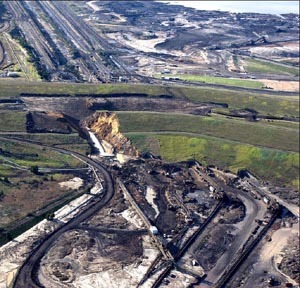 "Yallourn open cut mine transforms into 'Lake Yallourn'", ABC News, June 7, 2012. "Interview: John Parker, Secretary of Gippsland Trades and Labour Council, on Yallourn open cut flooding", ABC News, June 7, 2012. (Link to audio file). John Ferguson and Pia Akerman, "Power at risk as flood hits coal supply", The Australian, June 07, 2012. Tom Arup, "Power supply safe despite flooding, says Baillieu", The Age, June 7, 2012. Ashley Gardiner, "Mine now a muddy great mess", Herald Sun, June 07, 2012. This page was last edited on 29 January 2013, at 20:18.